Shadow-feast is a chronicle of dying—the awareness, denial, pain, and hope surrounding incurable illness, as well as the aftermath of grief as told from three points of view: Hers, His, and Theirs (the couple). The collection as a whole is a Kage-zen, or Shadow-feast, a traditional Japanese meal offered to the dead. However, here it is set out not for an absent beloved, but for the reader. flung over mountains where sun could blink and waver it off. Clouds muscled in to not let them see the bald sky lying. no motion, just New England birch, stripped limbs in late light. "...The speaker avoids the ordinary and with perfect craft and words that behave just right, she creates new forms for loss — and loss is gradual here allowing the poems to track demise in the richness of its grain. Grief is unbelievable yet Houlihan has to believe and makes us handle it the way she handled the lathe, page by page. Critics compare her to Emily Dickinson and I think I know why. They each distill language and feeling to a crystalline state that never tells a lie. 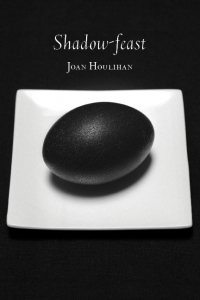 Reading Houlihan reminds me of why I first loved poetry." Read the full review. "...a stunning poetry array on the death of her beloved...." Read the full review. "...Houlihan’s language is stripped of all connective tissue, leaving minimal punctuation and deliberate use of idiosyncratic spacing to convey meaning...." Read the full review. "Shadow-feast is a tour de force sheared of excess, breathtaking in its leaps, and thrilling in its sonic resonances. Joan Houlihan touches uncannily on the hidden pulse of experiencing her husband’s death. The perspectives that form the three sections, Hers, His, Theirs, evidence Houlihan’s ability to discern the distance from and proximity of each to each...." Read the full review.